The Noble Nimble Thimbles Quilt Club was established in 1991 by the late Mary Burns. Less than a dozen quilters attended that first meeting and the club has since grown to around seventy-five members. Meetings typically begin with a brief business meeting followed by roll call and “show and tell”. Each month members are challenged with a lesson presented by one of the members or an outside speaker. The club supports several local charities. Raffle Quilts are made upon request for the Noble County Extension Homemakers’ annnual fundraiser. The Noble House, a shelter for abused women and children, Common Grace and ARC of Noble County are some of the recipients of club donations. 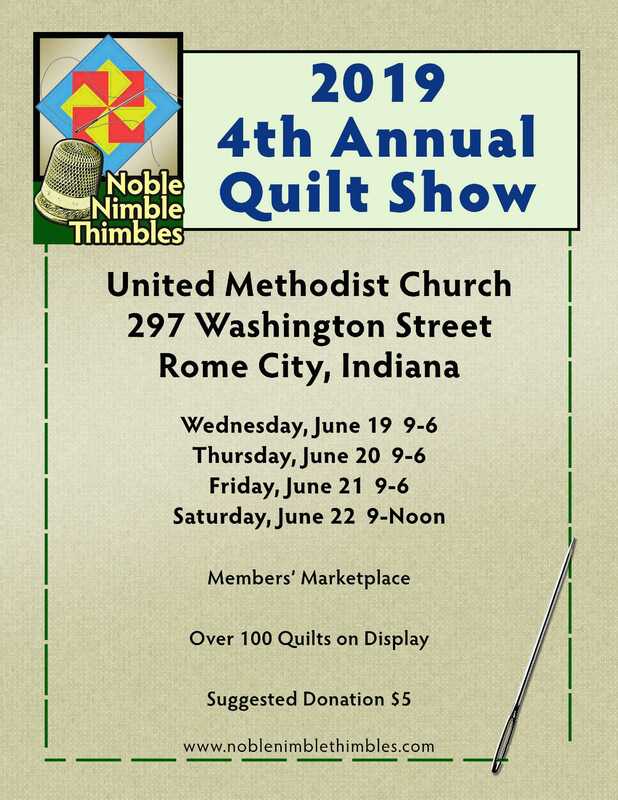 The Nimble Thimbles sponsor an annul quilt show in Rome City in conjunction with the Shipshewana Quilt Fest in June. The club members’ quilts are displayed each year at the Noble County Fair. The group has sponsored the Gathering of Quilters in 1996, 2006, 2012 and 2013. The quilters enjoy a “Fun Saturday” twice a year when they bring their sewing machines and learn new projects. The participants each bring a dish and share a delicious potluck lunch and a great day of quilting and fellowship at the Noble County Public Library in Albion. The club also holds a quilt challenge every spring when members compete for prizes in a designated category of quilting, and they hold a club garage sale in the fall. Meetings are held in Albion, IN on the fourth Tuesday of each month at 7 PM. Members and visitors gather in the Dekko Room in the basement of the Noble County Office Complex South, 2090 State Road 9.